To re-create The Godfather Chronological Saga using all available footage with the Widescreen Restoration Versions + Deleted Scenes + LaserDisc + Novel For Television. – Since all Deleted Scenes are presented in FULL FRAME 1.33, they have been sized to match the Widescreen 1.85 aspect ratio, adding black bars to the sides of the picture. – To keep from abruptly cutting from Part I to Part II to Part III, a musical interlude against a black screen was added between each film, with a Title Card presenting each new chapter. – In the TV SAGA version, Coppola incorporated deleted scenes shot for THE GODFATHER of Kay praying for Michael and lighting candles in church. However, instead of placing the scene after the evens of the first film (as in the novel, where the scene takes place), Coppola instead placed the scene at the end of PART II, running the end credits over the scene. Some Godfather fans had issues with Kay praying for Michael after the events in PART II, with the footage clearly of a younger Kay. In order to maintain the chronological edit of events, this scene has be re-placed at the end of PART I, after a short music interlude over black screen. – Since this edit is intended to be a chronological edit, the Alternate Opening Sequence for Godfather Part III was used. Coppola had intended to open the film on the business deal with Michael and the Archbishop (notice the same zoom out shot used from Part I), but later was convinced by editor Walter Murch to open the film on family instead of business. The scene was moved to 30 minutes later in the film. By moving the scene back to the beginning, the scenes that follow with the Archbishop giving Michael the award and the behavior at the party celebrations play very differently. – Since the quality of the Alternate Opening for Godfather Part III is in a rough workprint quality, only the first part of the Alternate Opening shot was used, then it cuts directly to the rest of the restored scene and plays as normal. – In Godfather Part III, a dissolve was added on the flashback to Michael watching Fredo’s death back to Michael receiving the award. – Scenes from THE NOVEL FOR TELEVISION are preserved here to create the most complete version of the Saga. – A BIG THANKS to FanFiltration and the remarkable 5 DVD LaserDisc rip with Deleted Scenes added. After watching that version, I decided to tackle a Widescreen Restored Version, since the quality of the recent DVD set is superior to the LaserDisc versions. – A SECOND BIG THANKS to fanedit.org’s theregencyelf for providing the extra scenes exclusive to the NOVEL FOR TELEVISION version. Now clocking in at 9 hrs and 48 minutes, the chronological edit of Francis Ford Coppola’s classic films has finally been restored in Widescreen 16×9 DVD’s. In 1977, while trying to secure funds for APOCALYPSE NOW, Francis Ford Coppola convinced the NBC TV Network to run a new version of THE GODFATHER and THE GODFATHER PART II edited together into a chronological order called THE GODFATHER SAGA – A NOVEL FOR TELEVISION (434 minutes). To expand the length over four nights, Coppola added over 75 minutes of new scenes into the film, including several outtakes used for additional opening/ending title sequences. Due to television restrictions at the time, many scenes of violence and language were censored. 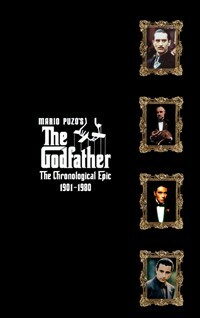 A shorter version of THE GODFATHER SAGA (386 minutes) was released on VHS tape in 1982. After the release of THE GODFATHER PART III, Coppola and editors Barry Malkin and Walter Murch constructed a new chronological edit called THE GODFATHER TRILOGY 1901-1980 (583 minutes). This version was released to VHS and LaserDisc in 1992 and is out-of-print. While many new scenes appeared in this version, several from the TV SAGA were still not included. 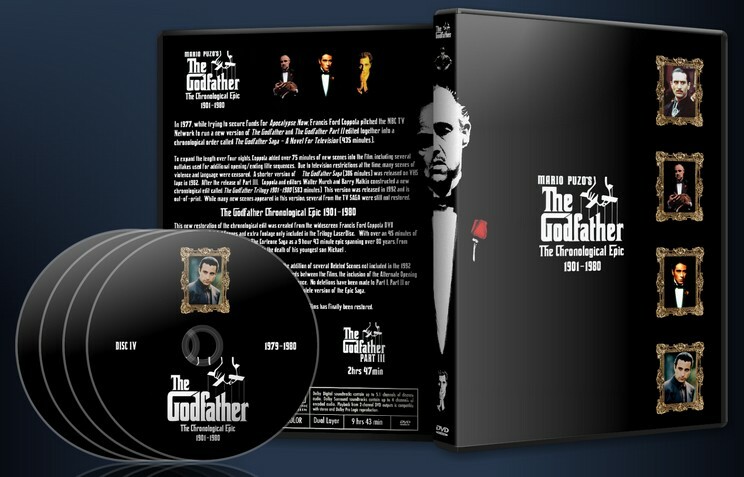 Now all the deleted scenes from NOVEL FOR TELEVISION, SAGA, TRILOGY and extra scenes from the DVD release have been combined to create the longest and most complete chronological version of THE GODFATHER. – Added new Date Title Cards as the story progress through the years. and dissolved to Michael having his hand kissed in Part II. – Created new musical interludes between each film. – All Deleted Scenes from the DVD Collection were used. – Several shots from the LaserDisc version were used. member with their name + birth/death date and scored using “Coda” from The Godfather Part III soundtrack. – Added a mixture of End Titles from all three films. This edit is epic, in every sense of the word. Clocking in at more than 9 hours, it is quite long, but a worthwhile experience. This is the entire legacy of the Godfather strewn together. While I love the original movies, this alternate take is absolutely fascinating. I enjoyed seeing all those added scenes, as they formed a fascinating new perspective. With the deleted scenes, you get to see more into the soul of Michael Corleone and his fall from grace and failed attempt at regaining it. It is truly a shame that Godfather III pales in comparison to the other two but I suppose it is something that one can easily live with. An aspect I found curious was that the scene where Michael tells his family that he’s joining the army is in it’s original place. Being chronological, I would have expected it elsewhere, but I suppose it works better that way. The title cards were a good idea, as they really make the thing seem operatic and epic, as it should be. The ending montage brought everything to a nice close and I’m glad you changed things up a bit for the V2 of this, as now it is perfect as far as I’m concerned. Quality-wise, this is far better than the official chronological edition and I will enjoy it for years to come. The video on the most part is clear, better than the original Godfather DVD, and the audio sounds good too. Great work!